Hello lovely nail geeks! 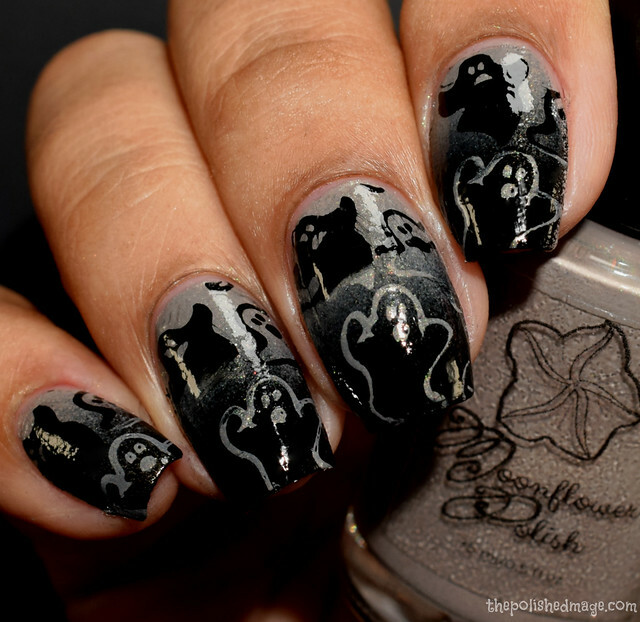 Today I am sharing my swatches from several amazing makers and their horror movie inspired polishes! When I was younger I absolutely refused to watch them. Like, my husband was one sad panda when we were dating because it was an automatic NOPE. Recently I’ve gotten a little curious and have come around to enjoy them. Shocking really. Though I’m still a chicken for paranormal themes, it’s got to be a crappy one for me to watch. We’re going to go through these alphabetically, so tuck in for the ride! Inspiration: by one of the opening scenes in “Perfume: The Story of a Murderer”. In this scene young Jean-Baptiste Grenouille, who was born with a superior olfactory sense, is taking his first whiffs of twigs, leaves and a green apple tree. Official description: a blend of mac apples and a bushel of greenery and a touch of citrus (green leaves, arugula, cyclamen, basil, key lime and bergamot). Acetone Antidote is an additive containing glycerin and jojoba oil to help protect and moisturize your nails, skin, and cuticles during polish removal. This one smells like crispy leaves and fresh apples to me. It’s SO fall. I’m not big on apple scents, but this one is that fresh, crisp type with a perfect balance of leaves and a touch of earthy scent in the background. I add one vial to roughly 7 ounces of pure acetone and its works beautifully! I get the powerful removal of pure acetone without the drying effects and there is a lovely lingering scent left behind. It’s also fantastic for in between swatching marathons where you need to clean up a little without getting your cuticles ashy right before pictures. If you’re craving fall, TRY THIS. *Please note, my label looks different from the ones being released this month- ya’lls will be the new round labels. Inspiration: the host, a corpse puppet, in the TV show Tales from the Crypt. 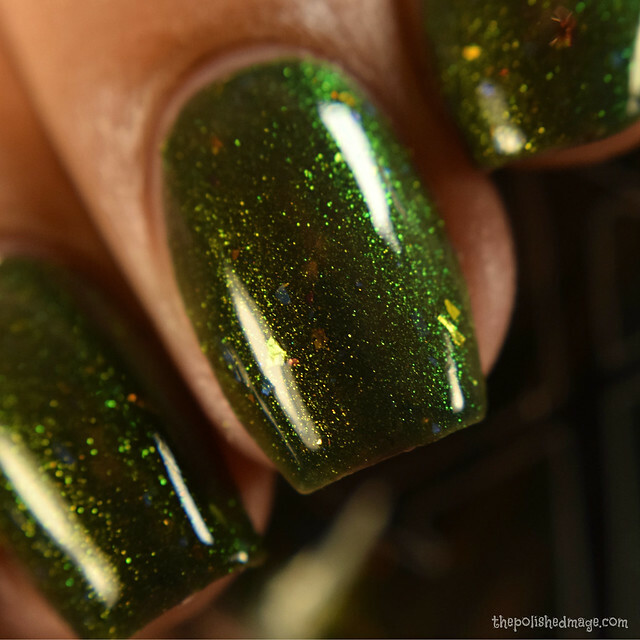 Official description: this eerie green, an army fatigue/olive base is filled with gold to green to blue UP sister pigment, piercing blue glass flakies (just like the Crypt Keepers blue glass eyes) and pink/copper/gold/green UCC flakies. It’s a perfect color for fall too! Swatches show three coats with topcoat. The formula is very squishy and jelly like and applies lightly, but builds easily. This sucker is shifty. In regular lighting you’ll mostly see a copper glow, and on tilt you can see all types of shifts between blues, greens, coppers, and golds. 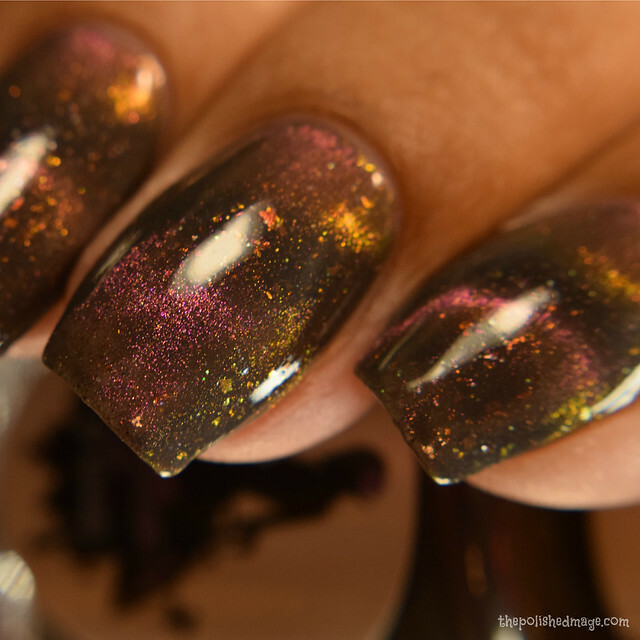 The flakies round out the final look and give a multicolored appearance thats densely scattered. No texture after topcoat. Inspiration: Jurassic Park and the rain scene where the T-rex is after everyone! Official description: a murky, deep muddy brown base with a shifting microflake shimmer of green-teal-blue and purple at the far edges and extreme angles. Swatches show three coats with topcoat. I wasn’t sure when I heard brown, but then I saw it in person and got excited. Then I turned into one of those aliens from Toy Story and ooooh’ed when I wore it. The base is a dark chocolate brown and the shimmers are very strong and easily shift between greens, teals and purples. You’ll mostly see a teal green, but barely wiggling your fingers it’ll shift on you. 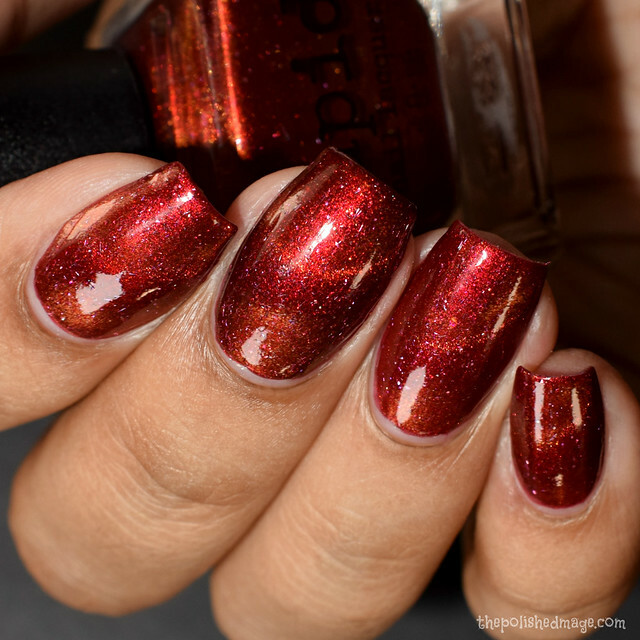 I’d recommend a glossy topcoat to bring all those shimmers out. No texture after topcoat. 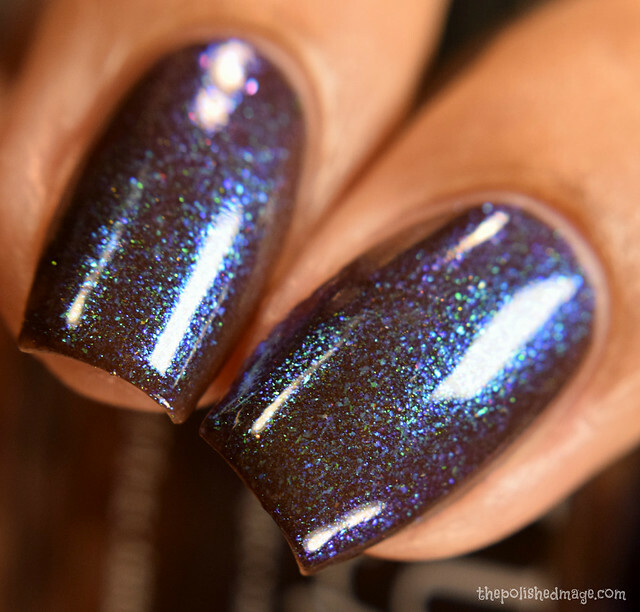 Official description: a blue-lavender holo base with a red-gold aurora, purple and gold iridescent shimmer, holographic micro flakies, and iridescent blue flakes. Swatches show two easy coats with topcoat. One thing I’ve really come to love about CK the more I work with her polishes- is that they are super loaded with all kinds of pigments but apply really easy and opaque. This is something I’ve come to expect from the brand and Heart of the Witch is no different. 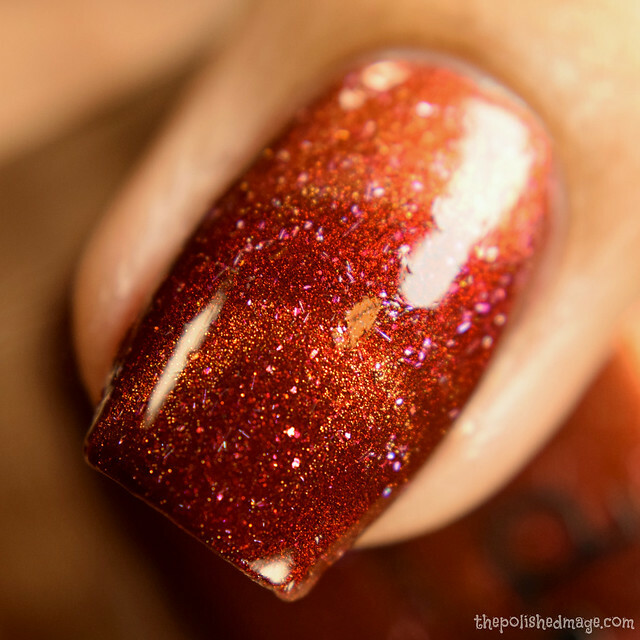 It’s positively packed with glitters and holo for a very sparkly look of the slightly larger particle variety. I also have smooth nails after using a quick dry glossy topcoat. In person it’s a dusky blue- the full mani shots are color accurate to me. The low light macros are to demonstrate the shifty shimmer in there. In shade, you’ll see a golden glow pop out with a pink glow in regular lighting. No texture after topcoat. Official description: an emerald green multi chrome magnetic, infused with glowing purple to pink aurora shimmer along with accenting lime green and iridescent flakies, thats bound to make you think twice before you play any game. Swatches show three thin coats with the magnet applied on the third coat. This one has a jelly feel to the formula, though I think most can get away with two coats. The magnetic particles shift easily from a rich pink to a bright gold. There’s lot of movement to the particles as well. The overall look gives a foiled type of sparkle and in shaded light you can see a double line with the pink and gold magnetic pattern. No texture after topcoat. Official description: a muted blue/gray linear holo with color shift copper to gold with iridescent flakes and glitter that shift copper-gold-green. Swatches show three coats with topcoat. I went a little thin on the coats as the formula is on the light feeling side, and I had zero VNL showing. 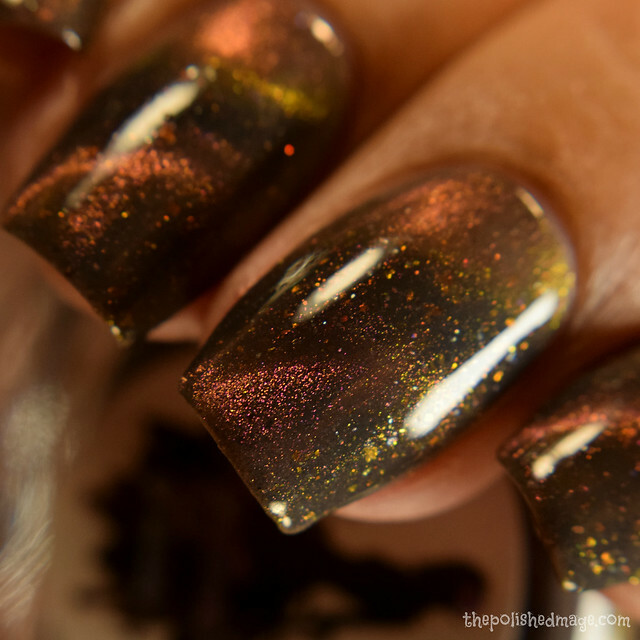 This is very holo (of the tinier particle variety), and in shade you’ll see the strong copper and gold shift come out. 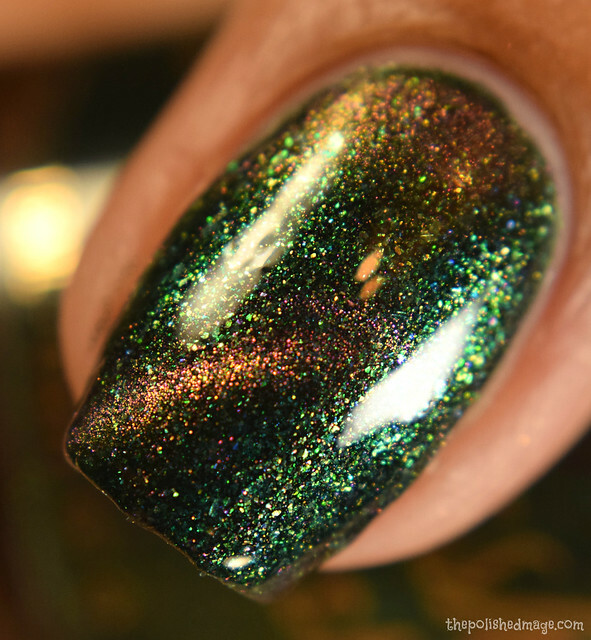 In any lighting you’ll see the iridescent flakes and copper/gold/green shifts of the glitters. Super smooth after topcoat. The base is a perfect balance between a dusky blue and grey, and can looking a little silvery in sunlight. 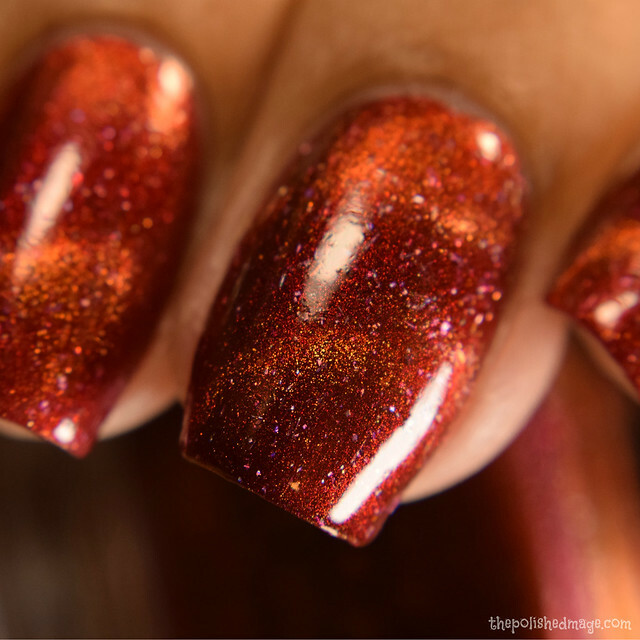 In person you’ll mostly see a strong copper shimmer giving depth, but it’ll easily shift on tilt. Swatches show two coats with the magnet applied on the second coat, and topped with a quick dry glossy topcoat. The formula has a nice buttery feel, and I went in with a thin first coat and slightly heavier second coat. Depending on your application type, three very thin coats will be fine but I feel like with this type of magnetic, a thin coat to make a foundation and a heavier second coat will give you a lovely magnetic effect. The base is a gorgeous dark grey and the magnetic particles had me saying ‘double rainbow’. They’ll appear pink but on tilt you’ll see secondary lines of bright gold. 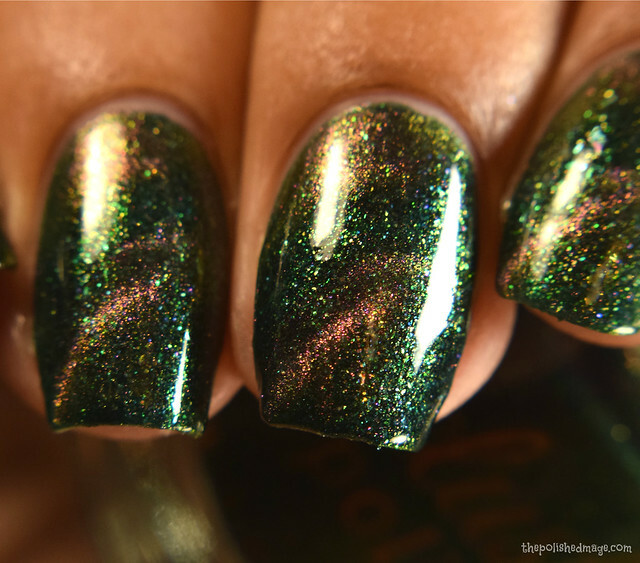 The full mani shots are color accurate and the macros are done in low lighting to show the double lines from the magnetic particles. The flecks all over give a rounded out effect with little spots of color here and there in a dense matter. Official description: a blackened teal jelly with blue/teal shimmer and purple/blue iridescent flakes. Swatches show two coats with glossy topcoat. This was really hard to photograph you guys! It is dark in person, but you can see it swimming with a teal shimmer and those big beautiful purple/blue flakes! Formula is on the medium side and applied very opaque. Just be mindful of your brush strokes and you’ll be just fine. I’d recommend a quick dry glossy topcoat to even everything out. 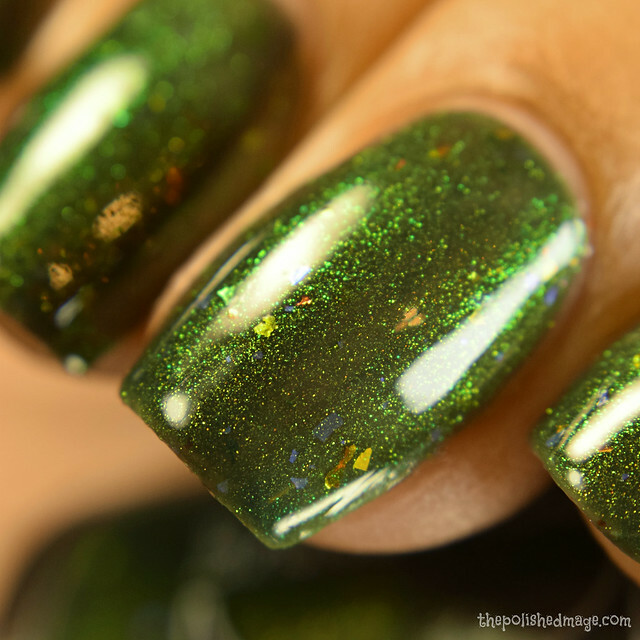 Moonflower Polish– Don’t Read The Latin! Inspiration: The Cabin in the Woods. From Nadia: I love this funny and satirical take on horror movies, that has a great twist on the end. The name comes from the line our unlikely hero Marty says when the kids find an old diary in the cabin they are staying at for the weekend. Of course, they read the Latin, which unleashes the redneck zombie family that starts things of. 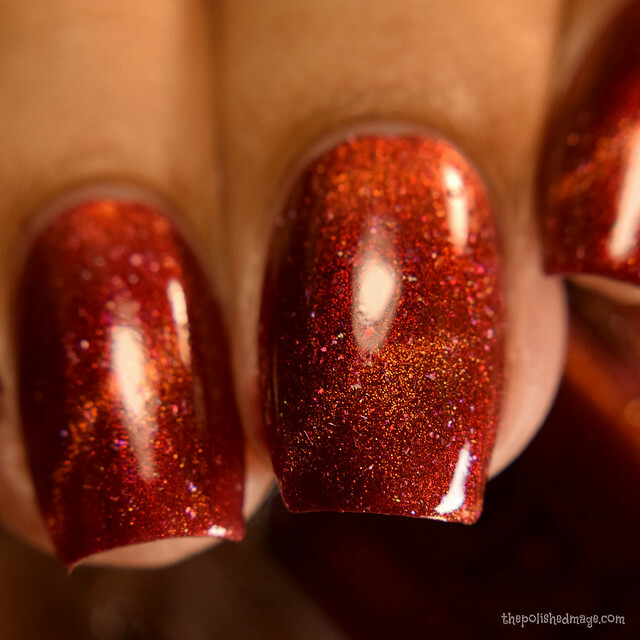 Official description: a greige creme stamping polish with a silvery shimmer, blue-gold microflakes, red-green aurora pigment, and red-gold aurora pigment. The base color is inspired by the movie poster with a little extra sparkle to make it special. 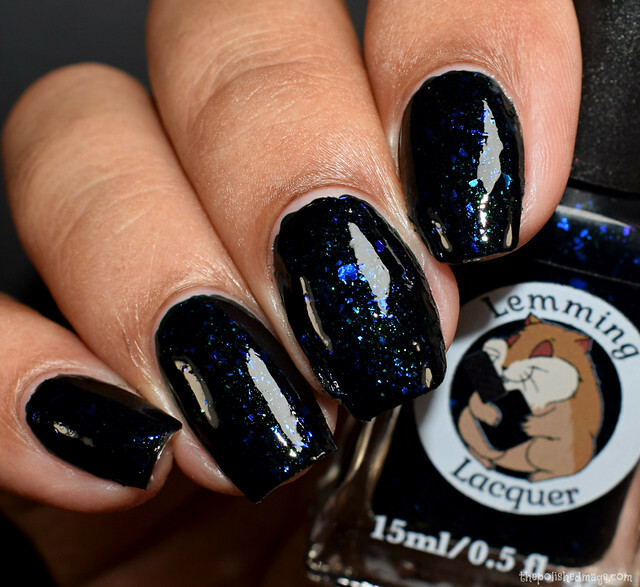 Opaque in 1 coat when worn as a regular polish, stamp over darker colors to see all the shimmers better. Okay, okay. I know, this isn’t the standard showing off with the polish by itself and over black and white. 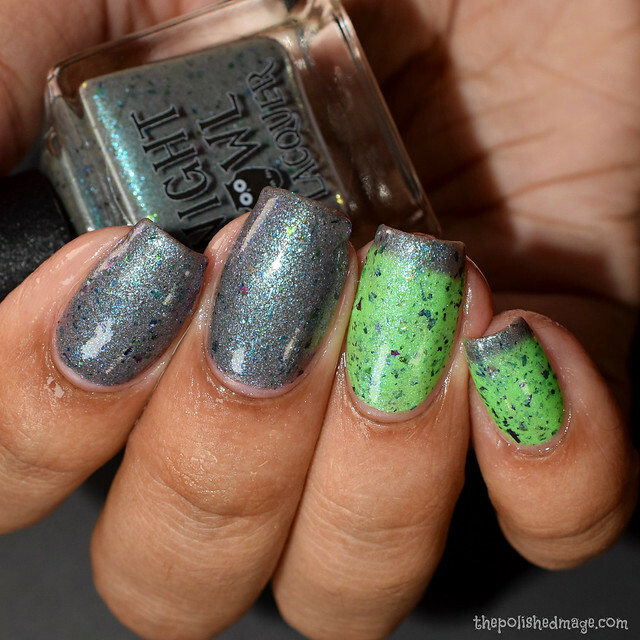 I wanted to go a little outside of the box this month with Moonflower. 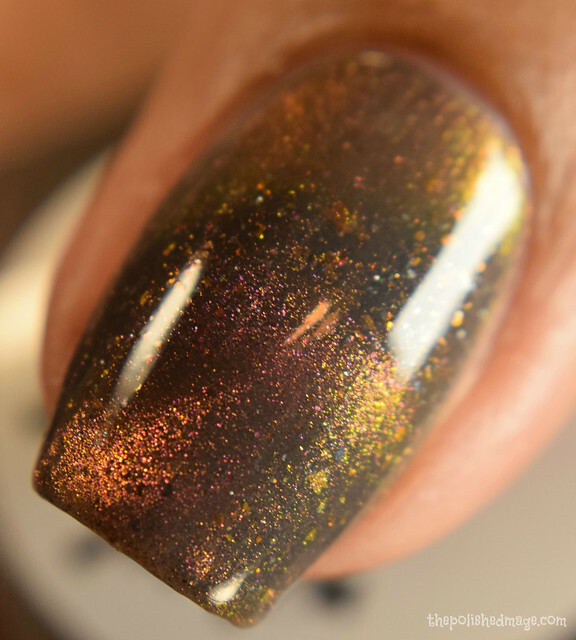 What you’re actually seeing here, is one coat on it’s own, then a gradient, then a stamped gradient. Those who are looking for an amazing stamping polish that legit does it all, I really stretched out what this bad boy can do. If you watch my swatch video, I have a full tutorial demonstrating all of the above. on it’s own it’s a creamy greige, more taupe in my opinion. If worn on its own, I found full opacity at a buttery one coat. 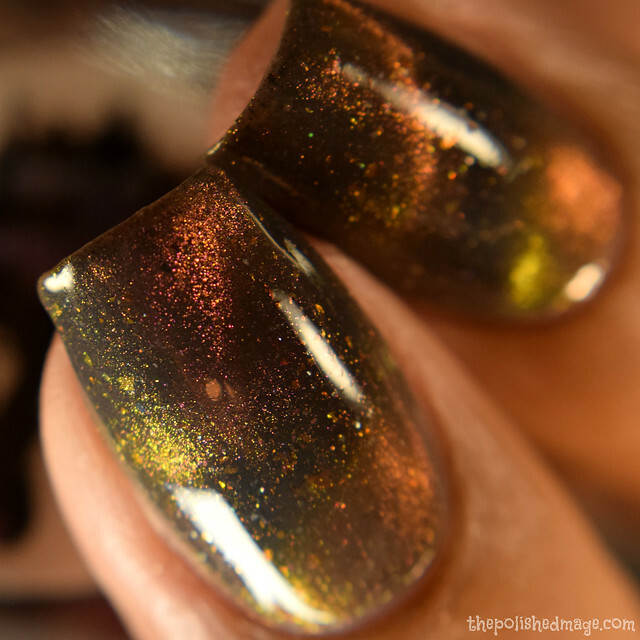 This one is loaded with shifty pigments that you’ll see if worn alone, or stamped (though they’ll be a touch subtle in that method). If used in a gradient those flakes and shimmer just pop. Watch the swatch video, I promise you’ll see it all come together. Ghosts will always be my favorite image this time of year. They’re precious. 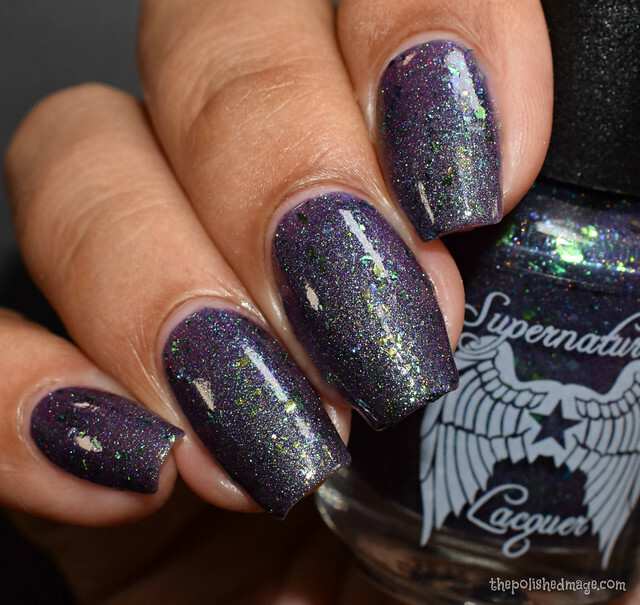 Official description: a thermal polish that goes from a dusky ethereal purple when cold to a bright green when warm with a shimmer that shifts green/blue/purple and several shades of green/blue/purple shifting UCC flakies. Swatches show three coats with topcoat. This screams fall to me, such a fun thermal! The warm state is that type of bright green that is slimy (and I mean that in the best way) it’s not the eye searing type, but a creamier neon green with cool undertones. NOL really knows how to do greens!! The cold state is a dusky purple, and on extreme cold I’m getting almost a dark grey color. I know it’s not officially a tri-thermal, but when it is transitioning I saw three colors, the bright green, the dusky purple and in very cold the more grey tone. I will say that when I was swatching the PPU colors I was very sick and running quite a bit hot so I’d imagine that was what gave me the in-between transition state when I put my fingers in ice water. My swatch video will demonstrate the full shift. Official description: dark purple base with green to purple shifting aurora shimmer, blue/green/gold UCC flakes, green/blue/gold color shift flakes, purple neon micro flakes, midnight black micro flakes and scattered holo. Dries matte. Swatches show three coats with topcoat. Formula has a light consistency, though not runny. 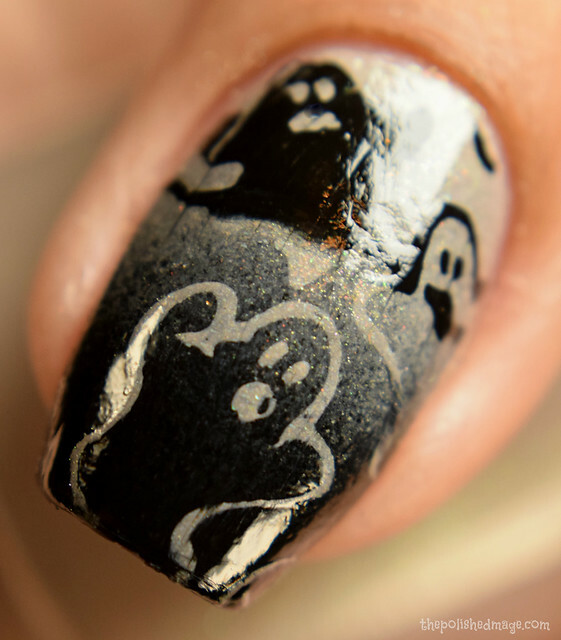 This will dry down satin-like so I recommend a glossy topcoat that brings it all out. You’ll see in the video, it’s like it starts screaming at you once topped. (Or wear it matte, whatever your fancy). The base is a grape-y purple and this thing is super shifty. You’ll see a vibrant purple, green and darker purple on tilt and there’s lots of densely scattered sparkle everywhere. Flakes behaved, and I had no texture after using a thick glossy topcoat. 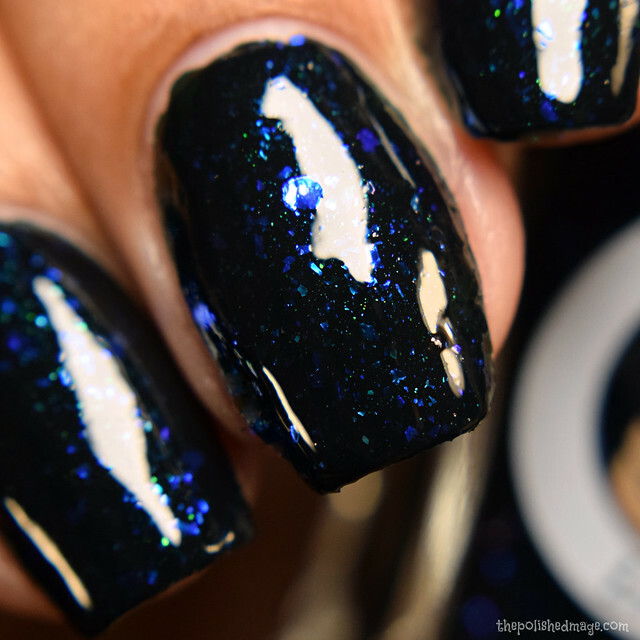 this is super complex and has lot’s going on, in one of my macro shots you’re seeing some transparency, I assure you in person my nails are perfectly opaque. 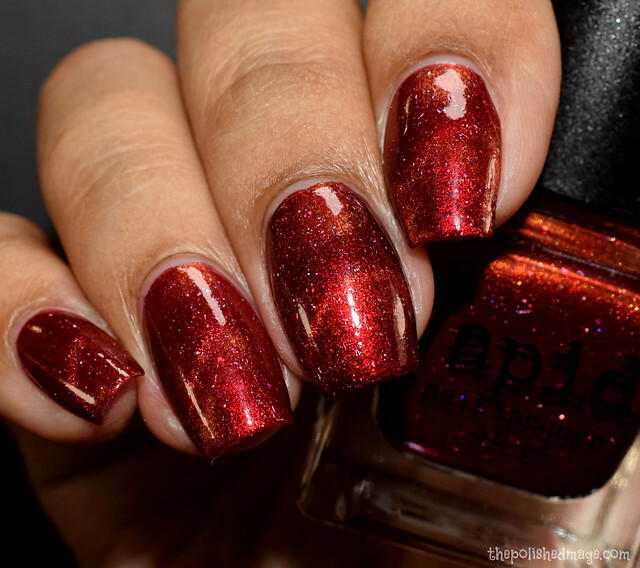 Official description: A bloody, brick red base, with a splatter of red/copper/gold shifting flakes and holographic silver flakes. But the magnetic is where this gets us locked and loaded, a copper-gold magnetic Ultra Chrome makes this come to life. 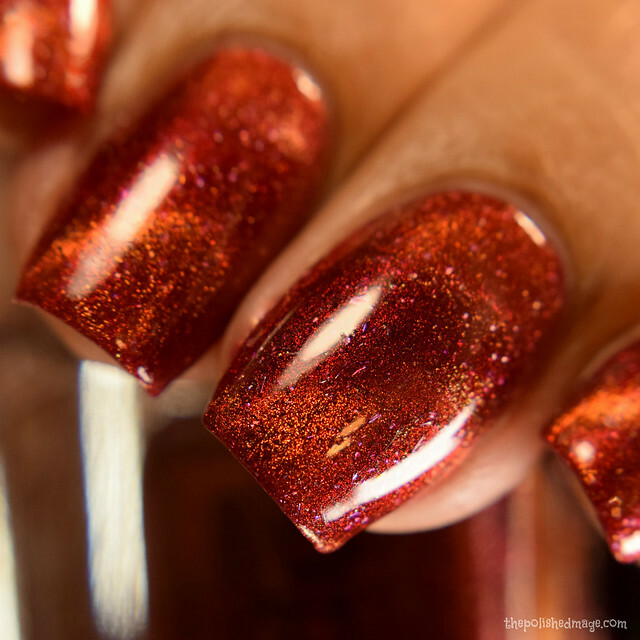 When magnetized the blood red base is deep and rich, not magnetized this polish shows a coppery, brick shade with a ton of sparkle. Swatches show two coats, with the magnet applied on the second coat and finished off with a glossy quick dry topcoat. The base is a crimson rich red, and the magnetic particles a fiery orange gold. 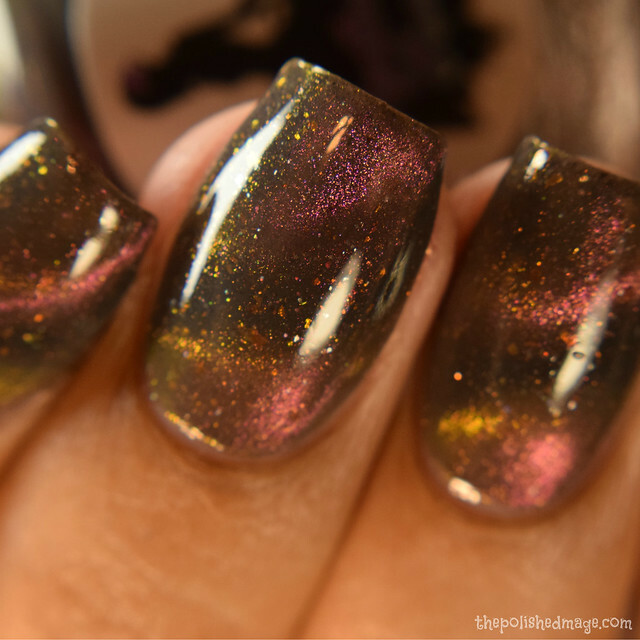 This pretty is packed with holo shards that some come off pink to me, giving a densely scattered sparkle. It’s like a phoenix, it’s got both cool and warm undertones in all the pigments so I’d say it’ll flatter anyone (I’m picky on reds). The magnetic particles have lots of movement to them, as you’ll see in my swatch video. There you have it! 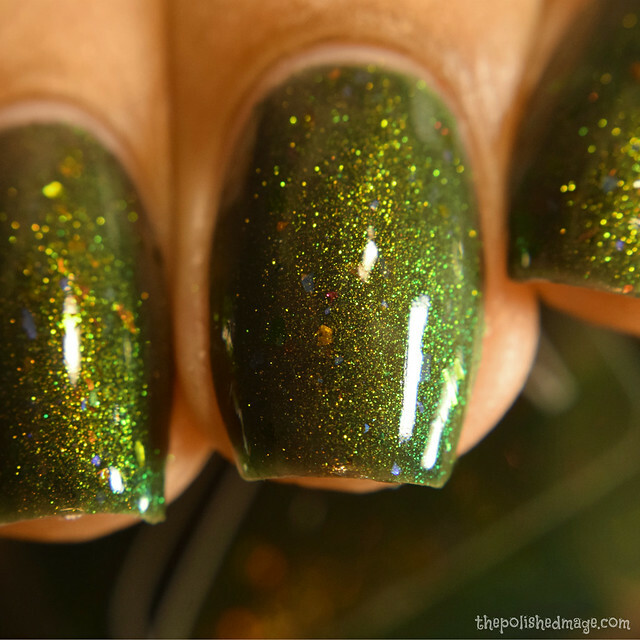 Polish Pickup will launch this weekend, starting September 7th at 11am EST. Get those wish lists loaded up! 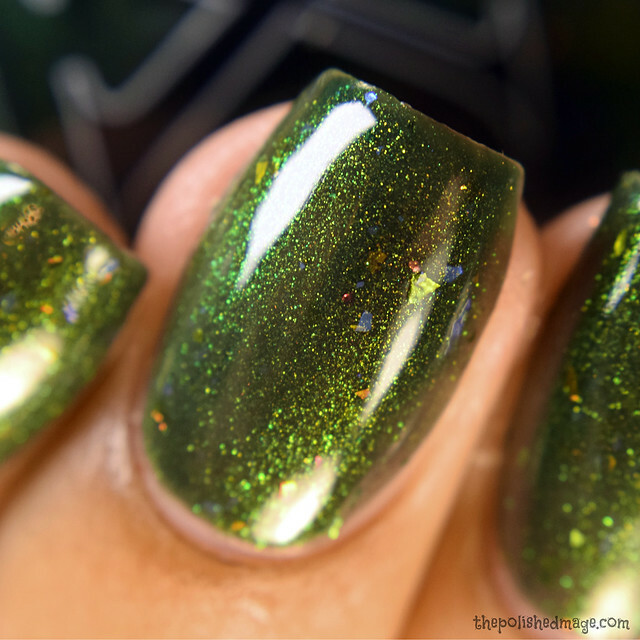 I love this month’s polishes so much, you absolutely can’t go wrong with any of these! Also, check out my swatch video to see all of these in action, as well as how I applied magnets/nail art and transitions. I’ll link you guys to the website too for ease! Fantastic as always! I’m still undecided on Baroness. I see green and immediately go into wanting!